The inspiration behind her book and why the strategies she encourages matter. The new book, The Healthy Workplace: How to Improve the Well-Being of Your Employees—and Boost Your Company’s Bottom Line, hit shelves this summer. We reached out to author Leigh Stringer (also one of our favorite contributors!) to find our what inspired her to write it, what a healthy workplace really looks like, and why it’s critical that we embrace these concepts now. What inspired you to write The Healthy Workplace? I was working 70 to 80 hours a week on an enormous project a couple of years ago. I was trying to balance a really demanding job with two young children in tow and I realized that the quality of my work and my family life was really suffering. I was overweight, tired, not exercising, all of which was also pretty negatively impacting my health. Then one day I just hit a wall. I just couldn’t power through anymore. I took three months off to rethink my own personal goals, but also write about “how to be healthier at work”. I became an avid student of all things health and wellness. I called a bunch of experts and started writing. I’m very open about this time in my life in my book because this idea of “being human and vulnerable” is not a topic that is not talked about at work very much, and a really important one for business. The truth is that we all have limits – we’re people and not machines – and we have to take care of our health and well-being, and pay attention to what engages and fuels us to be our productive best. When it comes to conversations about being healthier, why is it so important to target the workplace and enact change there? Because we spend more time at the workplace than anywhere else (70 percent of our waking hours), and, technically, it’s impossible to squeeze in all of our healthy habits after work and on the weekends. Investing in health and wellness at work has a VERY strong ROI. One meta-study I cite in the book shows an average payback of good wellness programs at 6:1. Paying attention to health increases share price. Several studies are out now that compare companies that invest in employee health and healthy workplaces are outperforming the S&P 500. Companies that invest in health and well-being of their employees are seeing higher retention rates and lower recruiting costs. Buildings promoted as “healthy” are showing higher absorption rates. I could go on and on about this. The data is clear. Companies that are taking care of their employees and really paying attention to what makes them tick are seeing better financial results. Companies that continue to ignore the “human” side of their business, or pretend that health, performance, well-being, and engagement aren’t really part of their business model, or maybe they just address it at the surface level, are going to fall behind (if they aren’t already). What does the ideal (yet achievable) healthy workplace look like? I had the real privilege of talking with leaders of some of the most innovative, healthy workplaces I’ve ever seen. 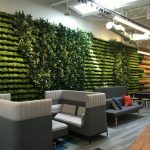 And what I mean by this is that they are places where employees are clearly integrating health and well-being in their work and workday and seeing results. I honestly didn’t realize these organizations really existed before I started looking for them. The walls are covered with pictures of people. Companies that value human health also value their people. Healthy companies are plastered with pictures of employees getting awards, celebrating, hosting community service events, etc. I didn’t see a lot of oil paintings of past executives in the halls; rather, I saw all kinds of photos of individuals and teams that looked like they’d been taken recently and likely updated on a regular basis. A sizable percentage of the workplace real estate is dedicated to healthy activities. This might mean having a gym or mini-gym on site, but sometimes these healthy organizations just used conference rooms or other traditional workspaces for working out, meditation, or eating together. Food is readily available, and it is healthy. Most of these healthy companies realize that their employees get hungry, and provide places to sit down and eat as well as some combination of refrigerated and non-refrigerated healthy food. Sometimes this food was subsidized, sometimes not. There is an informal dress code. If your employees are truly integrating movement throughout their day as all of these doctors are telling us to do, then they are in walking meetings, using treadmill desks, doing 4:00 PM “plank-offs”, trekking back and forth to the gym, biking into work, etc. All of this movement calls for more athletic-wear and fewer bowties. Walking through these healthy workplaces, I was surprised at the fact that they were truly vibrant places to work, but they didn’t feel pristine or polished in any way. They were really heavily used, flexible, and almost “experimental” in feel. You get the sense that these organizations are constantly testing new ideas and moving things around. Tell us about three things (about which readers will learn more about in the book!) that really surprised you during research. We’ve evolved from hunter-gatherers into sitter-starters. William Leonard — head of the Department of Anthropology at Northwestern University in Chicago — and his colleagues estimate that based on modern hunter-gathering practices, our evolutionary grandparents walked or ran an average of eight miles a day, looking for food. The other key aspect of physical activity in subsistence societies is the fact that much of their daily work is done at a slow-to-moderate pace versus high intensity workouts. They slowly burn energy looking for food all day. So for most of human history, the work of hunting and scavenging was pretty much our full-time job. Today, Americans average 5,900 steps per day (less than three miles). Some companies are getting rid of email. Yep, you read that right. One New York real estate executive I spoke with has banned internal emails and is using new tools like Slack and Asana with his team. Before this ban, he was spending 100 percent of his time in the office just responding to emails, with no time for collaborating, thinking, or working on the next project. Using new tools has allowed his team to work on projects in a more streamlined fashion, without a lot of back-and-forth, saving stress and time. He claims to have recaptured at least five hours a week and saved “a day” of his team’s time a week due to more efficient communication and streamlined meetings. Scents can impact your productivity. Most of the time when we talk about smell in the workplace, it is a bad thing, but not all smells are disruptive. In Japan, the Takasago Corporation carried out research into how smells affect the accuracy of typists. It found 54 percent made fewer errors when they could smell lemon, 33 percent fewer with jasmine, and 20 percent fewer with lavender. In another study, a significant positive relationship was evident between the presence of a lemon scent and mood. What’s one idea from the book that you’ve incorporated in your own day-to-day life? One of the things I learned during some heavy book-writing periods is that if I am really focused and fully engaged research and writing, I am only productive about seven hours a day. It’s easy to measure productivity while writing, because you can count how many words you write and easily measure quality of those words when you do re-writes the next day. I was kind of shocked by this, because most of my career I have worked 50-60 hour weeks. When I really sat down to measure my performance I realized I’ve got about 30 really productive hours to give a week, then everything goes downhill. Interestingly, the “30-hour work week” is starting to get some traction in Sweden. Since 1950, Sweden, Britain, Germany, the Netherlands, and all four Nordic countries have cut the time the average person spends working by at least 20 percent. In the U.S., we have only decreased our hours five percent since 1950, so we might want to re-evaluate our strategy. I currently work 30 hours a week, and by almost every metric, am performing better than I ever have before. I really try and make those 30 hours focused and results-oriented, and then give myself some slack to do extra-curricular activities outside of those hours that fill me with energy (rather than take it away). I don’t have the formula worked out perfectly yet, and every week is different, but so far, so good. I highly recommend a shorter work week it if you can make it work for your lifestyle and budget. Thanks, Leigh! To purchase your copy of the book, click here. The fifth annual summit was held on March 16 in Washington, D.C. Highlights from our webinar with Michael Housman and Andrew Knight.